Of course, comfortable and practical is important, but the fun prints also have style enough to elicit compliments from friends at the Dog Park and even strangers at the mall. Durably designed and made for sure-footed traction. The Sloggers' heavy-duty lug sole is designed for sure-footed traction in water, mud, and muck. It provides the support and traction of a good work boot. Compare this to popular "foam" shoes, which offer little support or traction. The soles are also made from a long-lasting, durable material and they include up to 50% recycled material. Not all insoles are created equal. 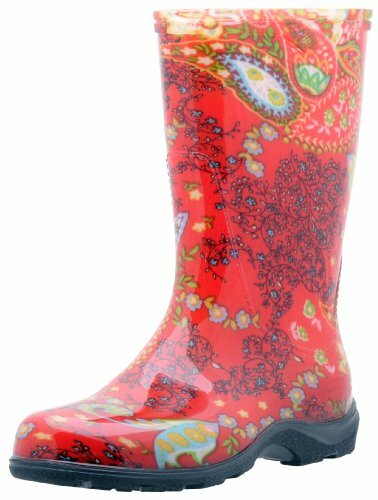 Most rain boots use cheap, flat, die-cut insoles. 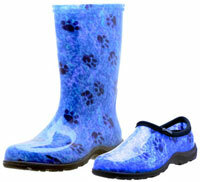 Believe it or not, some rain boots don't even include insoles. The Sloggers' "All-Day-Comfort" insoles are 7mm thick at the heel and 5mm thick at the ball of the foot. They are formed, not flat, and include a skived support material under the heel. 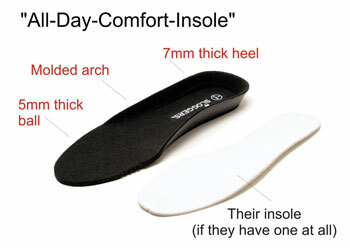 The "All-Day-Comfort" insoles are one of the main reasons that Sloggers get such great reviews. The company believes that if you're going to spend your money buying their shoes, then you deserve a quality insole. Let's face it, buying shoes online is a bit of a guessing game. Some women think the fit is true to size, some feel they run small, and some think they run large. The fact of the matter: every manufacture uses a different last (the shape of the inside of the shoe) and everyone's feet are a little different. Almost all women who are in between sizes should order up and buy a "Half-Sizer-Insole"
The chart below is a good starting point. Contact Sloggers directly with any additional questions. * H.S. 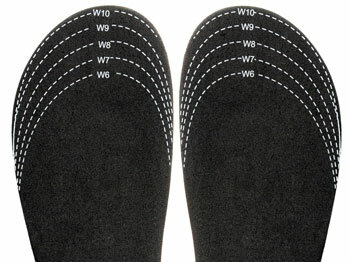 = "Half-Sizer" cut-to-fit-insole--cut and place UNDER the existing insole to reduce the fit by 1/2 size. Suggested Sloggers Size: sz 6 w/ H.S. * 6 sz 7 w/ H.S. * 7 sz 8 w/ H.S. * 8 sz 9 w/ H.S. * 9 sz 10 w/ H.S. * 10 sz 11 ** w/ H.S. In addition to utilizing Best Manufacturing Practices (BMP's) regarding the environment, Sloggers attempts to maximize the amount of recycled material they put back into their shoes. Currently, they can add up to 50% of mixed recycled material in their soles, and they are able to use 100% of the clear material scraps back into the uppers. The company also encourages you to send your shoes or boots back to them when they have finally reached the end of the road. They will grind them up and add them back into a new pair of shoes. Includes Sloggers' exclusive "All-Day-Comfort insole for maximum comfort. Heavy-duty lug tread for excellent traction. Fit info: Whole sizes only. Fits true to size. Half sizes order up. For a perfect fit, search for the Sloggers Half Sizer insole (style 330BK, ASIN B000KMA9X6). Height: 10.5" Circumference: 15"
Hose off or wipe with wet cloth. Removable insole, soak and air dry to clean. For replacement insoles order direct from Sloggers. If you have any questions about this product by Sloggers, contact us by completing and submitting the form below. If you are looking for a specif part number, please include it with your message.